Ramming attack, attempted stabbing reported near Tekoa in eastern Gush Etzion area south of Jerusalem. Terrorist eliminated. 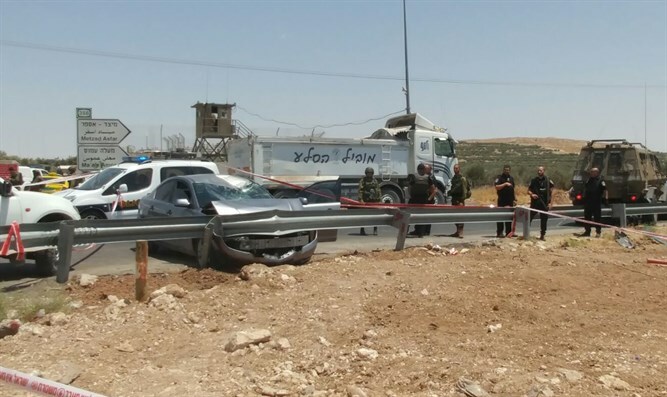 A ramming attack was reported in the Gush Etzion region south of Jerusalem Monday afternoon. The incident occurred at the T junction which links highways 3156 and 356, near the towns of Maale Amos and Tekoa in eastern Gush Etzion. MDA has reported that a 20-year old soldier was injured in the attack. According to an initial investigation into the attack, the attack rammed his car into a fortified position used by soldiers guarding the popular hitchhiking spot. A streetlight was hit and knocked down in the attack, striking the soldier. The soldier was treated on the scene, then evacuated to a Jerusalem hospital. He has been listed in moderate stable condition. United Hatzalah reported that the terrorist attempted to stab officers after he exited his vehicle. The terrorist was shot and killed by security forces after he lunged at them while brandishing a knife.